PROVENANCE: Sotheby's Hong Kong, 20th November 1984, lot 365. NOTE: Qianlong flasks of this pattern are illustrated in the revised Sekai Toji Zenshu, vol. 15, Tokyo, 1983, pl. 151 from the Idemitsu Museum of Art; in the Illustrated Catalogue of Ch'ing Dynasty Porcelain in the National Palace Museum, pl. 5; in the Ohlmer Collection cat., no. 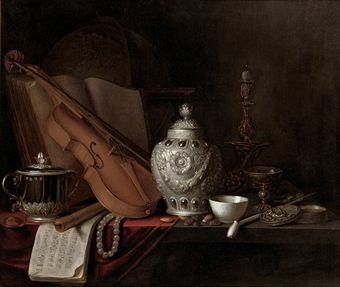 58, in the Roemer Museum, Hildelsheim; by Beurdeley, La Céramique Chinoise, Paris, 2005, no. 138, in the Brundage Collection; and by Macintosh, Chinese Blue and White Porcelain, pl. 59. 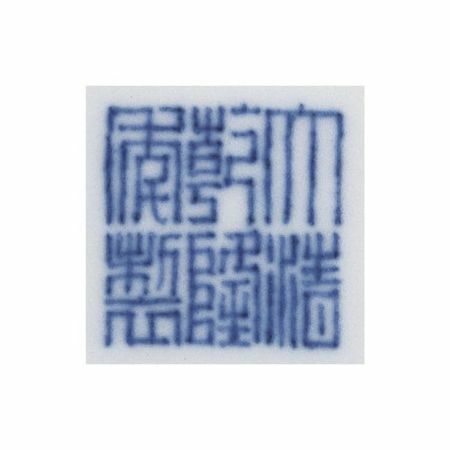 Another was inluded in the Tokyo Exhibition of Far Eastern Blue and White Porcelain, Tokyo, 1977, cat. no. 61. PROVENANCE: Christie's Hong Kong, 27th October 2003, lot 634. 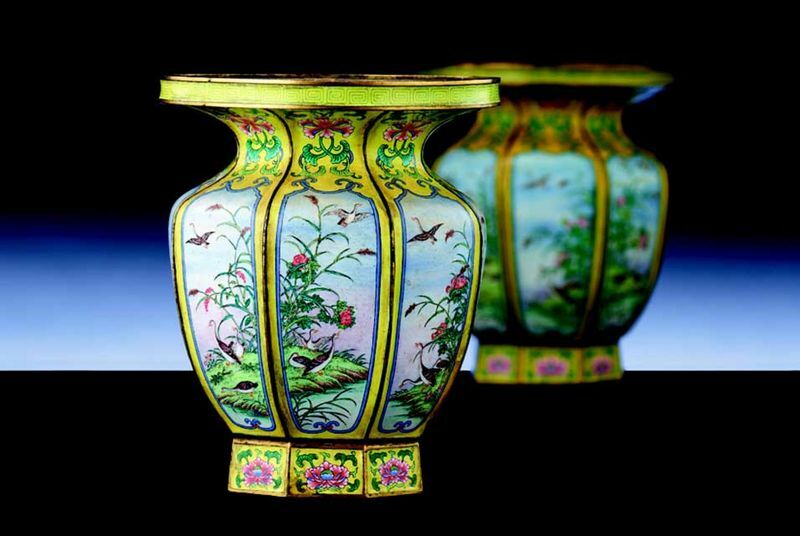 NOTE: Finely decorated with elegant blooms, a closely related example was sold at Christie's Hong Kong, 27th April 1997, lot 77, and twice in these rooms, 27th April 2003, lot 56, and 10th April 2006, lot 1686; and another was sold in these rooms, 26th October 1993, lot 189. 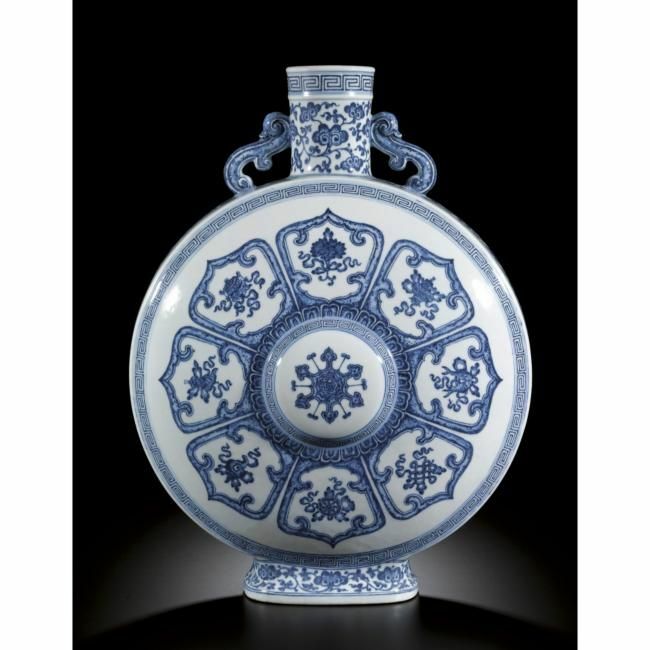 Compare also a flask decorated with flower scrolls in doucai enamels, in the Chang Foundation, illustrated in James Spencer, Selected Chinese Ceramics from Han to Qing Dynasties, Taipei, 1990, pl. 160. For the prototype of this form and design, see a blue and white flask of Yongzheng reign mark and of the period, decorated with a flower scroll design and interlocking sprays of lotus in underglaze red, illustrated in The Complete Collection of Treasures of the Palace Museum: Blue and White Porcelain with Underglazed Red (III), Shanghai, 2000, pl. 200. 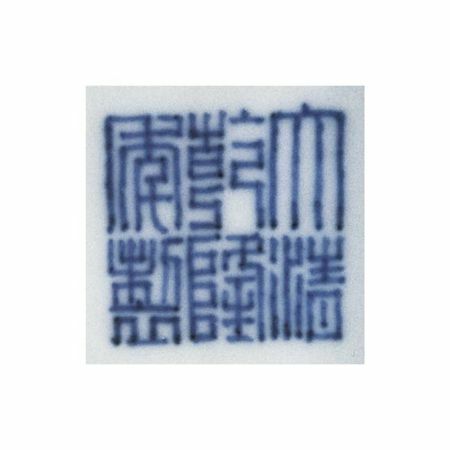 Compare also a blue and white double-gourd flask with a rounded, base, similarly decorated with flower scrolls, illustrated in Qian Zhenzong, Qingdai ciqi shangjian, Shanghai, 1994, pl. 160. For an example of this rare shape, but covered in a teadust glaze. See one, from the Hotung Collection, sold in these rooms, 21st May 1979, lot 126, and included in the Min Chiu Society exhibition An Anthology of Chinese Art, Hong Kong Museum of Art, Hong Kong, 1985, cat. no. 188. A pair of Yongzheng teadust flasks, illustrated in Chinese Ceramics in the Idemitsu Collection, Tokyo, 1986, pl. 961, was sold in our London rooms, 10th December 1985, lot 271. PROVENANCE: One of the pair of vases sold in Sotheby's New York, 24th May 1974, lot 420. Sotheby's Hong Kong, 19th May 1987, lot 270. 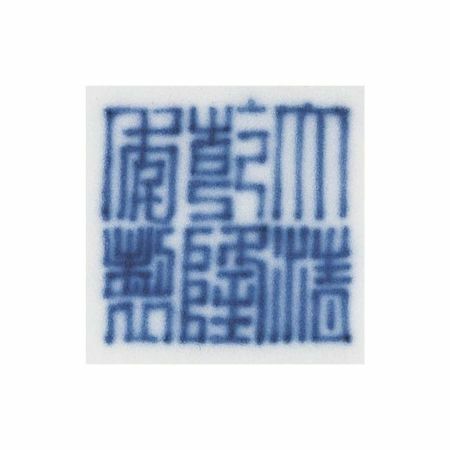 EXHIBITED: Exhibition of Ming and Ch'ing Porcelain from the Collection of the T.Y. Chao Family Foundation, Hong Kong Museum of Art, 1978, cat. no. 79. NOTE: The marks of lots 270 and 271 were switched in the back of the 1987 T.Y. Chao catalogue. 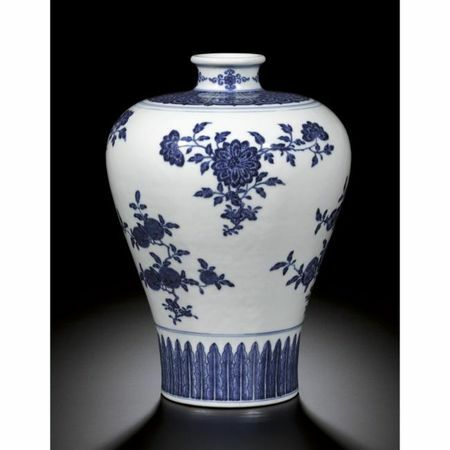 A Qianlong vase of this pattern is illustrated by Macintosh, Chinese Blue and White Porcelain, col. pl. IX (top left); and one from the Edward T. Chow Collection was sold in these rooms, 19th May 1981, lot 546. Another is illustrated in Min Shin no Bijutsu, pl. 167, together with a meiping painted with the same design in underglaze-red and blue, pl. 168. 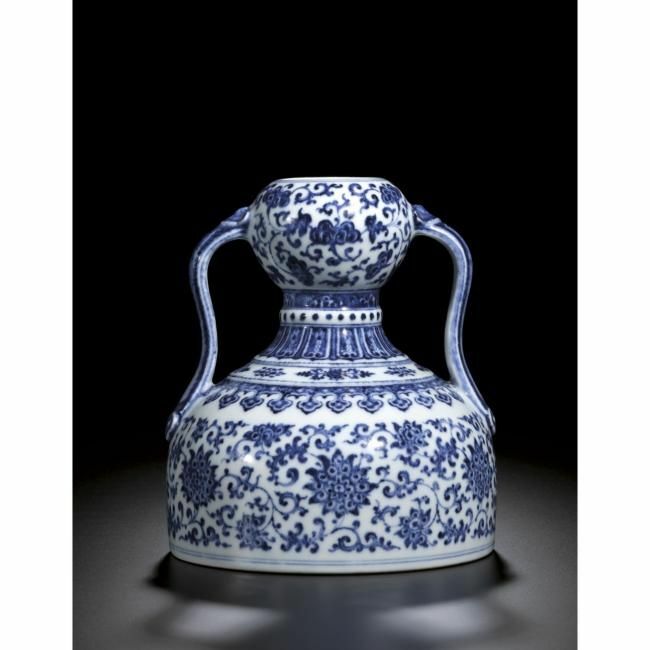 For the 15th century origin of this design compare the vase included in the Illustrated Catalogue of Ming Dynasty Porcelain in the National Palace Museum, Yongle ware, pl. 12.